At InterExchange Au Pair USA, we're celebrating our 25th anniversary this year with Memories That Mean the World. What's a Memory That Means the World? For us, it's the type of memory that only happens through cultural exchange, when young au pairs from around the world make unforgettable connections with welcoming U.S. host families. This month's Memory That Means the World comes from our 2013 Au Pair of the Year Gavin McKay, from the U.K., and his host family, the Schlachters. Gavin arrived in Seattle ready to make an impact on his new family, especially Elliot, 2. "When I said goodbye to my hometown, I wasn't sure what experiences lay ahead of me, but I welcomed the challenge," said Gavin. "When I arrived at the baggage claim in Seattle, I was greeted by my host mom, Rebecca, holding her two-year-old son, Elliot Miles. They each smiled enthusiastically and an American flag was proudly gripped in Elliot's hand. Once home, Rebecca offered a tour of the house, following which Elliot and I played with the United States snow globe that had been placed in my room. I showed him how to turn the dial to play an American anthem, music that would serve as the soundtrack to my experiences over the coming months." Gavin and the Schlachters' memory of their airport meeting was just the beginning of a great relationship, thanks in large part to Gavin's tremendous attitude. "Gavin starts and ends every day with a kind word. Everyone with whom he comes into contact knows and loves his radiant smile and Irish charm. He is a joy to have around the house, from his dedication to the happiness and well-being of my son to his readiness to help with dishes, laundry, cleaning and trash. Whatever it takes to be part of our household, Gavin welcomes [the opportunity]," said Rebecca. Gavin's can-do attitude impacted not only his host family, but his entire cluster of au pairs. "Gavin has been a great addition to our local Seattle area cluster. His positive attitude and welcoming outreach have connected our newest au pairs, often before they have even arrived here," said Tauryn Beeman, Local Coordinator for the Seattle area. "Some au pairs would be daunted by the responsibility of working and living with a single parent. But Gavin has continued to show his positive nature in how he approaches his small host family, and seems to thrive with his role as mentor to her young son." 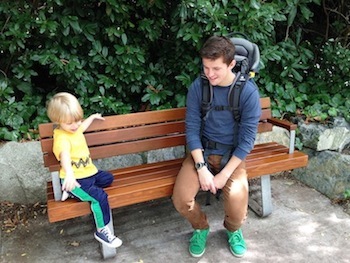 Gavin's connection with Elliot not only helped him earn our 2013 Au Pair of the Year award, but turned him and Elliot into stars in their local community. "[Gavin's] adventurous spirit complements his daily adventures with Elliot. The two of them are local celebrities, popping in and out of the children's museum, the play gym, the zoo and wherever else the bus can take them before nap time," said Rebecca. "They are recognized wherever they go. Gavin's bright-eyed enthusiasm for new experiences, whether taking a photography class or mastering the bus routes, provides a wonderfully consistent role model for Elliot while confirming my belief that he is the best au pair in the world." For Gavin, the Memories That Mean the World created with his host family extend far beyond one year. "I'm proud to have taken part in his journey, memories of which I will forever retain," he said. "As for myself, I have adapted to the American way of optimism, hopefulness and resourcefulness, while avoiding any semblance of homesickness. I know my family in Coleraine (Northern Ireland) eagerly awaits my return and I am excited to extend my learning to them: from baking a freshly-made pie to raking the leaves without prompting from my dad. My year in America will benefit more than just me: I can't wait to share my new life and my happy days with my friends and family back home and to continue the friendships that I've made in my other home."